The ten camping sites of the province have been improved in several aspects, among them the installation of two fans per cabin, in order to renew the conditions for a better stay in the current summer period. According to Liván Rodríguez Padilla member of the provincial staff of camping sites, this improvements are still in process, because the final goal is to fixed these appliances in the cabins. Other benefits will be the installation of a TV set in every cabin and the assignment of flour for the sale of pizzas and other products in the cafeterias. To go camping is a very popular option for Cubans, so camping sites are not always enough for the entire province, that is why a great amount of their 20 000 capacities for summer is delivered to the Young Communist League and other youth organizations to be distributed among their members. Another part of the capacities is assigned to the Confederation of Cuban Workers, the Committees for the Defense of the Revolution and the Confederation of Cuban Women. Salto Los Portales, Dos Hermanas, La Caridad, El Taburete, Pajarito, La Altura, and the international area of Aguas Claras are some of the centres that will give their services to the people. Two of these sites are being set archery and bowling areas, they are Pajarito and Salto Los Portales. 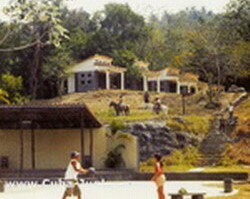 And San Pedro have received more horses for their excursions. The communities where these centres are located can enjoy the recreative options of video clubs and other spaces, always coordinated by camping site workers. One of the main problems that faces this way of recreation is related to transportation, since just eight of the twelve buses intended to give service are in good conditions to work.